A while back a few friends had us over for a dinner party. After spending a few weeks in different areas of Indonesia and Thailand, these friends had picked up different local recipes they wanted to try out on their home turf. Delan was kind enough to share one of the recipes on to me, and I’ve finally built up the guts to make it myself. 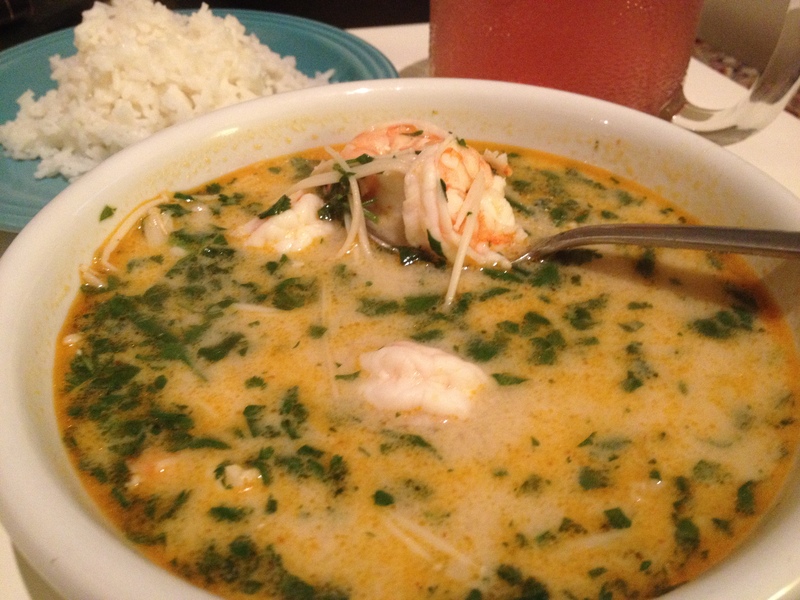 It’s Tom Yum Goong, a spicy and sour soup served with lemon grass and shrimp. From the first bite (or slurp), I realized this soup was what my life had been missing. I had had cravings for the multi-layered flavors in this soup my entire life, yearning for the freshness, the sweet, the nasal clearing spice, and never even realized it until that first moment of taste. Chicken soup can go to hell. What my soul needs is Tom Yum. To make this soup even more special, most of the ingredients must be purchased from specialized Asian markets – especially when you live in Texas. Ironically, the closest one to me is a place called MT Market. The first time I heard of the place, I wondered why anyone would name their shop “Empty”. 1lb prawns/shrimp cleaned and deveined. I like a larger shrimp, but what ever your preference will work. 7-10oz. stalk mushrooms. When you get enough of these deliciously thin stalk fungi swirling around in the broth, they act just like noodles. 3 stalks lemon grass cut into 2 inch segments. 4 lime leaves, torn. I couldn’t find these any where, but if you can find it don’t chop these suckers. Just tear them. 1/2 cup galangal in slices. This is from the ginger family and the stuff we get here is usually grown in Hawaii. 1 cup cilantro. The recipe actually calls for a bunch of coriander. Do you know what fresh coriander leaves are? They’re cilantro. 3 TBSP chili oil/paste. Normally I’d use Srirachi, but this particular recipe noted Nam Prik Pow. I couldn’t find that, so I used 2 TBSP of chili oil and 1TBSP of srirachi. And it was spicy. Burn-your-lips spicy. So keep your own heat tolerance in mind when you make this. 1/4 cup lime juice. Limes are cheap – Get your self 4-6 limes and use the fresh stuff! 1/2 TBSP lime zest. I used this because I couldn’t find lime leaves, but the original recipe does not call for it. 5 tsp fish sauce. If you don’t have fish sauce you can use salt, but fish sauce is available everywhere, even Walmart, and it’s flavor in this is worth it. 4 cups water. Austin water is pretty questionable what with the mold and all. I don’t mind using it for pasta, but for this I used bottled stuff. Put the water on to boil. Once it’s rolling, throw in the galangal, lemon grass, mushrooms, lime leaves (if you found them, other wise use the lime zest), and the fish sauce. Bring back up to a boil and toss in the shrimp and coconut milk. Bring to a boil again; this all doesn’t take long at all. Once it reaches a boil again, turn off the heat. Add the chili oil/paste and the fresh chopped coriander-better-known-as-cilantro. Just before serving, add the lime juice. The lime juice must be added right before serving to create the fresh and sour flavor. I love the way the chili oil dances around the edges and top of the soup. You can make it with chicken, but if you follow the directions you simply can’t cook the shrimp wrong and they go so well in this. Make it when you’re sick to perk you up and clear your sinuses. If it’s too spicy for you, drizzle an additional tablespoon or two of coconut milk over your serving and stir to quell that fire right down. Chip actually dumped his rice right into the center of his bowl, making it a bit like a gumbo. And I looooove the mushrooms; they’ve got the perfect texture and are like uber healthy noodles. This amazing, fresh, sour, and spicy concoction stands beautifully on it’s own or serve it with a bit of sticky rice and a beer on the side to quell the heat. Also, don’t eat the galangal or lemon grass; I suppose you could, but they’re really just for flavor and quite woody. 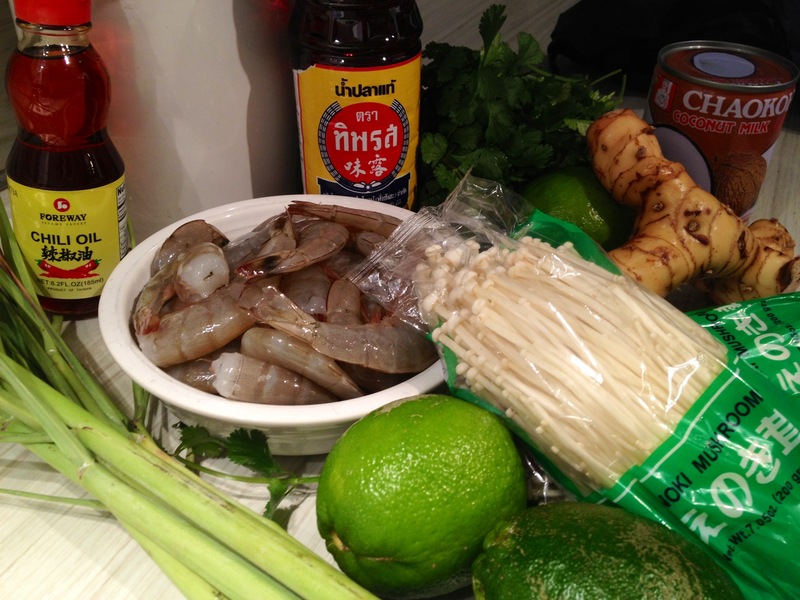 This entry was posted in Geek Chef, Recipes, Uncategorized and tagged asian, comfort food, diet, dinner, food, shrimp, soup, tom yum. Oscars Be Damned: New Harry Potter Box Set Is (almost) HERE!